Geikielite: Mineral information, data and localities. 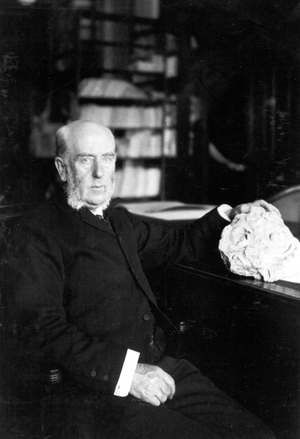 Sir Archibald Geikie, Director General, British Geological Survey. For Sir Archibald Geikie (Edinburgh 28 December 1835 – Haslemere, Surrey 10 November 1924), Professor of Geology and Mineralogy in the University of Edinburgh, Scotland, and Director-General of the Geological Survey of Great Britain and Ireland. Ilmenite Group. Geikielite-Ilmenite Series. 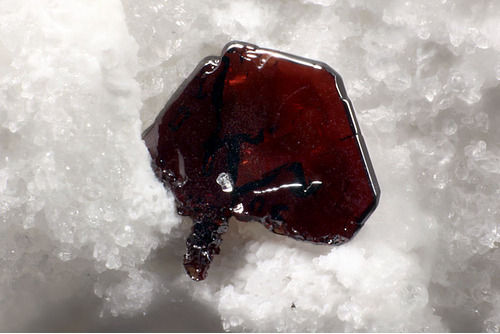 The magnesium analogue of Ilmenite, Pyrophanite, and Ecandrewsite. 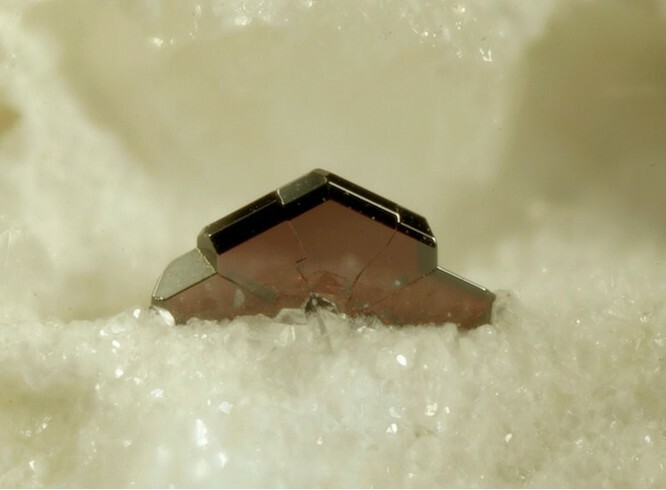 The titanium analogue of Akimotoite. May be confused with Hematite. Calcite 7 photos of Geikielite associated with Calcite on mindat.org. Lizardite 6 photos of Geikielite associated with Lizardite on mindat.org. Spinel 5 photos of Geikielite associated with Spinel on mindat.org. Pseudosinhalite 4 photos of Geikielite associated with Pseudosinhalite on mindat.org. Tazheranite 1 photo of Geikielite associated with Tazheranite on mindat.org. Fluorapatite 1 photo of Geikielite associated with Fluorapatite on mindat.org. Phlogopite 1 photo of Geikielite associated with Phlogopite on mindat.org. Rutile 1 photo of Geikielite associated with Rutile on mindat.org. Titanclinohumite 1 photo of Geikielite associated with Titanclinohumite on mindat.org. Zirconolite 1 photo of Geikielite associated with Zirconolite on mindat.org. Fletcher (1892), Nature: 46: 620. Palache, Charles, Harry Berman & Clifford Frondel (1944), The System of Mineralogy of James Dwight Dana and Edward Salisbury Dana Yale University 1837-1892, Volume I: Elements, Sulfides, Sulfosalts, Oxides. John Wiley and Sons, Inc., New York. 7th edition, revised and enlarged: 535-541. Anthony, J.W., Bideaux, R.A., Bladh, K.W., and Nichols, M.C. (1995) Handbook of Mineralogy, Volume II. Silica, Silicates. Mineral Data Publishing, Tucson, AZ, 904pp., 2 volumes: 220. Kolitsch, U. (2018): 2095) Arsenopyrit (Co-haltig), Fluorapatit, Geikielith, Klinochlor und Zirkonolith im Spinell-Forsterit-Marmor von Kochholz, Dunkelsteinerwald, Niederösterreich. Pp. 238-240 in Walter, F. et al. (2018): Neue Mineralfunde aus Österreich LXVII. Carinthia II, 208./128., 185-254. Gasteiger, P., Tropper, P., Haefeker, U. & Tessadri, R. (2013): Petrographie und Mineralchemie von Betafit aus dem Pollestal (Ötztal-Stubai Kristallin). Mitteilungen der Österreichischen Mineralogischen Gesellschaft 159, 55 (abs.). Houzar S.: Spinel z Číhalína a Nové Vsi u Třebíče, západní Morava. Minerál, 2010, 18, 1, 69-71. Novák, M., Šrein, V.: Ryzí antimon v rutilu z dolomitického mramoru od Studnice u Nového Města na Moravě. Minerál, 1997, roč. 5, č. 4, s. 265-266. O´Brien, H.E.& Tyni,M. 1999. Mineralogy and geochemistry of kimberlites and related rocks from Finland. Proceedings of the 7th International Kimberlite Conference, Cape Town, South Africa. Burtseva, M. V., et al. "Features of mineral and chemical composition of the Khamambettu Carbonatites, Tamil Nadu." Journal of the Geological Society of India 81.5 (2013): 655-664. Pascal, M.-L., Di Muro, A., Boudouma, O., Fointeilles, M., Principe, C. (2008): Zirconlite, calzirtite, baddeleyite, betafite, geikielite and qandilite in skarn ejecta from Vesuvius - inferences for the magma-wallrock interactions. EGU General Assembly 2008. Geophysical Research Abstract, 10, EGU2008-A-06674, 2008. ; Pascal, M.-L., Di Muro, A., Boudouma, O., Fointeilles, M., Principe, C. (2008): Zirconolite, calzirtite, baddeleyite, betafite, geikielite and qandilite in skarn ejecta from Vesuvius - inferences for the magma-wallrock interactions. EGU General Assembly 2008. Geophysical Research Abstract, 10, EGU2008-A-06674, 2008. The Canadian Mineralogist, Volume 42, Number 6, December 2004, pp. 1825-1845. Gieré, R., Williams, C.T. (1992): REE-bearing minerals in a Ti-rich vein from the Adamello contact aureole (Italy). Contributions to Mineralogy and Petrology, 112, 83-100. Gardes M.L., Baumgartner L.P., Valle J.V. (1999): Stable isotopic evidence for limited fluid flow through dolomitic marble in the Adamello contact aureole, Cima Uzza, Italy. Journal of Petrogr., 40, 6, 853-872. Nedachi et al (1984) Ganseki-Koubutsu-Koshogaku Zasshi, 79, 200-213. Watanabe et al (1963) Kotoite, Mg3(BO3)2, from the Neichi mine, Iwate prefecture, Japan. Proceedings of the Japan Academy, series B, 39, 164-169; Kato, A. & Matsubara, S. (1991): Geikielite, baddeleyite and zirconolite in dolomitic marble from the Neichi mine, Miyako City, Iwate Prefecture, Japan. Bulletin of the National Science Museum, Tokyo, Series C, 17, 11-20. Robinson, P., Langenhorst, F., McEnroe, S.A., Fabian, K. & Ballaran, T.B. (2014): Ferroan geikielite and coupled spinel-rutile exsolution from titanohematite: Interface characterization and magnetic properties. American Mineralogist 99, 1694-1712. 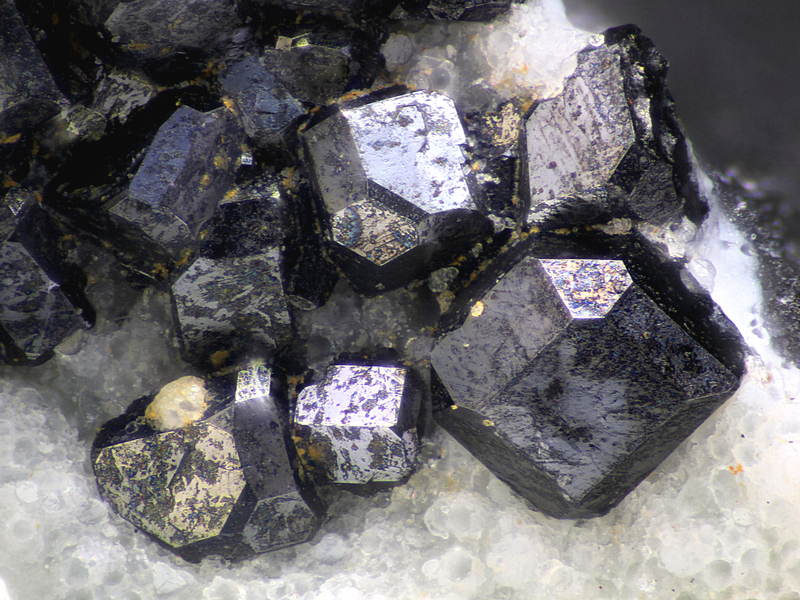 N. I. Krasnova (2001): The Kovdor phlogopite deposit, Kola Peninsula, Russia. Canadian Mineralogist, 39, 33–44. Minerals of South Africa; Lee, M. E., Goosen, W. E., Minnaar, E. G., & Liebenberg, T. Microanalysis of mineral inclusions in primary baddeleyite from the Phalaborwa complex. Anthony, J.W., et al (1995), Mineralogy of Arizona, 3rd.ed. : 230. Wise, Wm. S. (1959), An occurrence of geikielite: American Mineralogist : 44: 879-882; Pemberton, H. Earl (1983), Minerals of California; Van Nostrand Reinholt Press: 173, 460. Jenni, Clarence M. (1957), Crestmore and its minerals: Gems & Minerals, No. 238: (July 1957): 64, 79; Pemberton, H. Earl (1983), Minerals of California; Van Nostrand Reinholt Press: 173. Murdoch, Joseph & Joseph J. Fahey (1948), Geikielite, a new find from California (abstract): Geological Society of America Bulletin: 59: 1341-1342; Murdoch, Joseph & Joseph J. Fahey (1949), Geikielite, a new find from California: American Mineralogist: 34: 835-838; Cooney, R.L. (1956), The mineralogy of the Jensen and Henshaw quarries near Riverside, California: Unpublished Master’s thesis, University of California at Los Angeles: 43; Pemberton, H. Earl (1983), Minerals of California; Van Nostrand Reinholt Press: 173; Devito, F. and Ordway, A. (1984), The Jensen Quarry, Riverside County, California. Mineralogical Record: 15(5): 273-290.